After several attempts to enrol in medical schools Kiran Mazumdar decided to focus on biology. In 1973 she received a graduate honours degree in zoology from Bangalore University. The following year she followed in her father's footsteps by starting her professional career as a trainee brewer at Carlton and United Beverages in Melbourne, Australia. In the meantime she also completed a Diploma of Malting and Brewing at the Ballarat Institute of Advanced Education (BCAE), one of the University of Ballarat's predecessors. In 1974 Mazumdar-Shaw was the only woman enrolled in the brewing course at BCAE. Her diligence paid off when she managed to top the class, and vital knowledge and understandings acquired during her course have subsequently contributed to other successes. 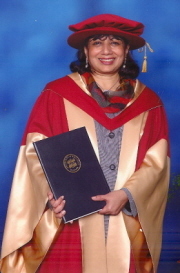 On 13 December 2004 the University of Ballarat recognised Mazumdar-Shaw's preeminent contribution to the field of biotechnology when she was presented with an Honorary Doctorate. Kiran Mazumdar-Shaw became India's first woman brew master upon her graduation in 1975. However, the brewing industry was an all-male domain and there were few career opportunities available to women at that time. After a series of rebuffs from the industry she turned her skills to the emerging biotechnology sector, becoming one of the earliest women to enter the sector when it was in its infancy globally. In 1978 she joined Biocon Biochemicals Ltd in Ireland as a trainee manager. A friend then persuaded to set up an export-orientated plant for her employer and this inspired her to establish Biocon India Ltd in collaboration with the Irish company, using seeding money secured from Irish scientist entrepreneur, Les Auchincloss. Mazumdar's previous experience in the brewing industry underpinned the co-invention of a unique cauldron based on fermentation techniques, which led in turn to the development of Biocon's now patented biotechnology reactor. The company enjoyed great success through the manufacture of enzymes until it branched out into pharmaceuticals in 1997. Biocon and its sister organisations Syngene and Clinigene have since evolved into a highly successful, fully integrated biopharmaceutical enterprise focused on healthcare. Biocon is India's only publicly listed biopharmaceutical company, and is committed to reducing therapy costs of chronic diseases like autoimmune, diabetes, and cancer. Through innovative products and research services it is enabling access to affordable healthcare for patients, partners and healthcare systems across the globe. Dr Mazumdar-Shaw is the chairman and managing director of Biocon. In 2004 she was listed as India's richest woman, and has been named among TIME magazine's 100 most influential people in the world. When Kiran Mazumdar-Shaw received an Honorary Doctorate in 2004 the Vice-Chancellor of UB, Professor Kerry Cox said, "The University has followed Kiran Mazumdar-Shaw's career with great interest. We are extremely proud of the achievements of our graduates. Some in particular, as is evident here, could easily be ranked amongst the best in the world. We are extremely pleased Ms Mazumdar-Shaw has enjoyed great success professionally. Her work on commercialising enzymes and pharmaceuticals is testimony to her persistence, entrepreneurialism and business acumen. The University takes great pride in the fact she is one of our most distinguished graduates." She was conferred with the Global Economy Prize for Business by Germany's Kiel Institute for the World Economy and Othmer Gold Medal by the Chemical Heritage Foundation in US for her outstanding contribution to biotechnology. Dr Kiran Mazumdar-Shaw, a most distinguished alumna of the University and a pioneer of the biotechnology industry in India, was honoured by Federation University Australia on Thursday 5 March 2015 with the unveiling of a road named after her at the Mt Helen Campus. 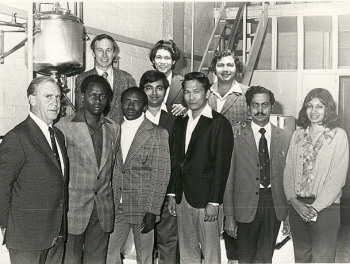 Image caption (LHS): The BCAE 1974 Graduate Diploma Class of Malting and Brewing. (Cat.No.6593) Back Row (L-R): Neville Gower (lecturer), Enrique Vazquez, Pawan Malik. Front Row (L-R) Geoffrey Barrell (Head of Section), James Ichoroh, Japeth Kadzitu, Pravin Mevada, Tomas Abrajano, Devandra Kumar, Kiran Mazumdar.